Designed by regionally prominent millwright and mechanic, Joshua Twing, the Twing Gristmill was originally part of an industrial mill and iron castings complex. Twing developed his industrial complex over several decades as his base of operations, where he experimented with the latest mechanical technology. 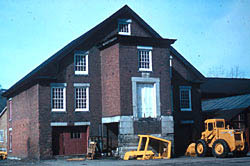 The brick gristmill, the only building to remain of the large complex, is representative of Barre's pre-railroad industries. Built in 1844, when Twing was sixty, the gristmill was based on the latest technological innovations and developments. For a utilitarian building, Twing's gristmill was unusually ornamented, especially the interior, possessing a double spiral staircase, paneled walls, marbleized columns, and wallpaper. These features, common in high style Greek Revival domestic interiors, were applied to the mill to enrich its industrial function. Decorative granite trim was liberally applied to the exterior. After Twing's death in 1865, the mill complex continued to operate, with the addition of water wheel technology, for more than 20 years. Subsequently, by 1910 the building became a storage house for most of the 20th century. The site is currently the base of operations for Hill-Martin Corporation, which sells heavy equipment. 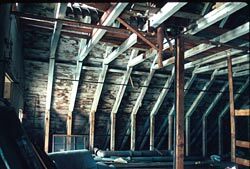 In the late 1970s, with virtually nothing remaining of the interior mechanical systems, the company undertook the rehabilitation of the mill for their offices. Many of the original interior details exist and were adapted into the office space. The Twing Gristmill is located at 450 North Main St. It currently contains the business offices of the Hill-Martin Corporation, and is not open to the public.